From Pygmy Hunting Songs To Taylor Swift, What Makes Music Universal : Goats and Soda Can you hear what's similar about a Palestinian line dance and Swift's "Shake It Off"? Or The Sound of Music's "Do-Re-Mi" and a Pygmy song? Scientists have finally decoded the language of music. 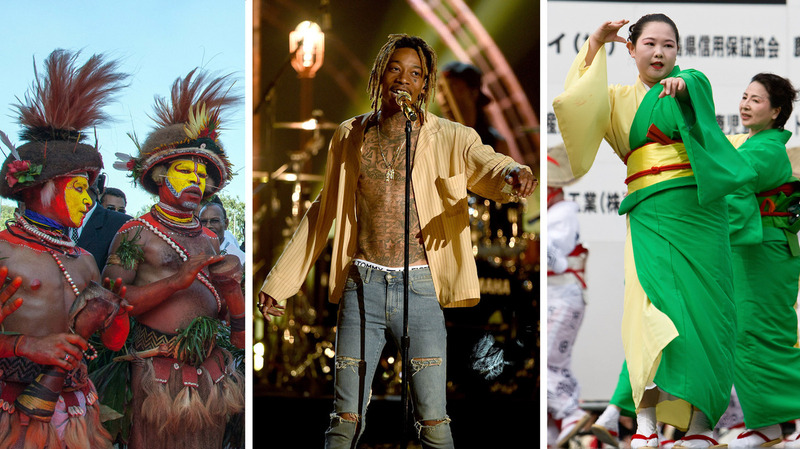 Even if you don't speak their language, you can likely communicate with these musicians through song and dance: Men from Papua New Guinea; Wiz Khalifa at the 2015 Billboard Music Awards; and Japanese dancers at the Daihanya Festival in Kagoshima City. No matter where you travel around the world, people share a few qualities. They cherish love for families and friends. They unite around good cooking. And they make music you can shake your booty to. "Music is the universal language of mankind," Henry Wadsworth Longfellow wrote in first major work, Outre-Mer. Yet nearly 200 years later, scientists still don't have a good understanding of how that language works. What are the nouns? What are the verbs? Which components are universal? Now a team of musicologists in England and Japan have started to fill in those blanks. They've identified 18 musical features that are common across all geographic regions. They reported their findings last week in the Proceedings of the National Academy of Sciences. The chorus of Taylor Swift's "Shake It Off" is a good example of a recent pop song with an obvious descending melody. Each phrase, "Playas gonna play, play, play, play, play" starts high and descends to end with lower notes. This collection of universal features connects "Do-Re-Mi" from The Sound of Music to a Pygmy hunting dance and Taylor Swift's hit "Shake It Off" to Palestinian line dancing. But it also allows people from all corners of the globe to communicate — without words, says graduate student Patrick Savage, who led the study. "Same with my daughter," he says. "Before she could talk, she wanted to bang on the drums, and we would sing together. She didn't know the words, but we were communicating through music," says Savage, who's working toward a Ph.D. in musicology at the Tokyo University of the Arts. Previous studies have looked for universal features in music by comparing songs from Western cultures with those from one or two very isolated, non-Western cultures. "But our study is the first to look at a wide and diverse sample of different types of music," he says. Savage and his colleagues obtained and analyzed 304 recordings from the Garland Encyclopedia of World Music. "It's the biggest, most diverse sample of world music out there," he says. Musicologists have collected recordings from around the world for the library. The set includes everything from Dominican merengues and Japanese folk music to recordings from a secret ritual in Papua New Guinea. Initially, Savage's team looked at how music differed from one region to the next — which rhythms, melodies and structures are unique to each part of the world. He wanted to find a musical fingerprint for each region. But what stood out, instead, were all the commonalities. "My colleagues were like, 'Maybe that's the interesting story here — not the diversity but actually the unity,' " Savage says. "There's actually some surprising features that unify all this diverse music." Some common features are quite predictable. For instance, almost all music uses discrete notes, has regular, predictable beats and consists of short phrases (less than 9 seconds long) that repeat themselves. "Do-Re-Mi" from the Sound of Music has some, but not all of the 18 universal features of music. The tune has a regular two-beat rhythm, short phrases and uses the chest voice to sing. But it doesn't have descending or arched melodies. This is a rare song where the phrases tend to rise rather than fall at the end. But some universal characteristics are a bit more cryptic. For example, most music uses only seven notes or fewer per scale, Savage says. "So, like, 'do-re-mi-fa-so-la-tee' ... and then it repeats," he says. "There are all different ways of constructing scales. But scales around the world almost always have only seven notes. There seems to be some restraint keeping scales small." Throughout the world, songs also use two types of melodies: arched (the pitch starts low, goes up and then goes back down) or descending (the pitch starts high and goes down). The chorus of Taylor Swift's "Shake It Off" is a good example of a recent pop song with a clear descending melody, Savage says. "It's very obvious that each phrase — 'Playas gonna play, play, play, play, play' — starts high and descends to the end. And as with almost all danceable pop songs, it has a two-beat meter." Rhythms based on three beats are common in Western music. "You know? Like waltzes: 1-2-3, 1-2-3," Savage says. But around the world, rhythms based on two beats or multiples of two (i.e., four beats) vastly outnumber the three-beat rhythms, Savage found. "Almost any popular song you can think of has a two-beat 'boom, cha, boom, cha' rhythm," he says, including a Palestinian line dance used at groom parties and the No. 1 hit of the summer, Wiz Khalifa's "See You Again" (which also has descending melodies). "Maybe it's because these rhythms are easier to dance to. We only have two feet, not three," Savage says. One universal feature had nothing to do with notes or beats, but with who's singing and playing the instruments: "Performances with only men tended to dominate throughout the world," Savage says. "In many cultures, there's a lot of restrictions about women playing instruments and singing music. Perhaps it's because patriarchy is a near-universal thing." A few recordings in the musical library, such as the ones from the secret ritual in Papua New Guinea, didn't have any of the universal features. In fact, those recordings didn't even have discrete notes or beats, Savage says. "They're very strange," he says. "They just sort of sound like moaning and gliding around." So is that really music? Savage isn't sure. "It just shows that, at the end of the day, we still don't have a good way of defining what music is," he says. People just know it when they, um ... hear it.